Orbit B-Hyve Bluetooth Smart Hose Faucet Timer w/Wi-Fi Hub #21004 BRAND NEW! If you are tired of hassling with hose and sprinklers, and getting poor results from manual watering, this new automatic system is a perfect solution. The system attaches to any outside faucet and includes six high-efficiency rotary sprinklers with patented Rain Curtain nozzle technology. I list the contents that are included in every sale. If an item is not listed such as a manual, original box or other small accessory, then I am not including that specific item in the sale. The condition is always disclosed truthfully as New, New-Other or Used. It does not include the housing or the electrical board behind it. This unit fits a 16 pin connector. Brand new, never been used or opened. Still factory sealed. Irrigating a landscape during a rainstorm not only results in oversaturated plants and turf, it also wastes water. Hunter's Mini Clik rain sensor provides the simplest, most effective way to prevent sprinklers from running during or after any level of rainfall. Only the Hunter Rain-Clik?., with its unique Quick Response?. The Rain-Clik can be mounted on an eave or any flat vertical surface like a wall or fence. A gutter mount is also available that allows for easy installation of the Rain-Clik on the edge of a gutter. 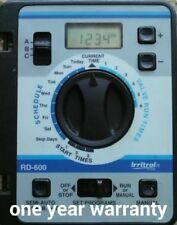 This Irrigation Timer must be used only for the control of irrigation systems , e.g. Lawn sprinkler, sprinklers and drip house, etc. 1-16 Set of water programs.Water Connection: 21mm tap with 26.5mm threadHose connection: 13mm(1/2") - Suitable for all known plug-in systemsWater Pressures: Max. 6 Bar / 150 PSI. Water Temperature: Max. 40 degreeIrrigation medium: Clear fresh waterBatteries: 2x 1.5V AAA size batteries （not included)Material: PlasticColor: GreenThe irrigation time: 1min-9h59minPackage Includes:1 x Irrigation Timer (Batteries not included)Note:Light shooting and different displays may cause the color of the item in the picture a little different from the real thing. The measurement allowed error is /- 1-3 cm. Brand . Here is a group of modules that when combined provide an automated watering system. The relay, normally open, will close. Closing down the pump. 1 USB Power lead. Main Colour 1 50cm Tube. USB Powered. Have a plot plan?. I can design. Have a technical issue?. I can resolve it. Located outside the United States?. No problem! We are here to exceed your expectations! Warranty Issues?. Orbit 91069 Rain/Freeze Sensor, Unused, Free Shipping US48! Full waterproof function. (Outdoor Use). Suitable water temperature: 0-40 degrees Celsius. Suitable for 0-8 kg water pressure;. Suitable for 0℃-40℃ water temperature;. Temporary watering function (won't affect the procedures that have been set. ). Most of the circuitry is in the faceplate so in the event of a power surge or nearby lightning strike, the faceplate is the first to go. It's a good place to start so you do n't unnecessarily spend your hard earned cash. Continuous Watering Up To 120 Minutes With Automatic Shut Off. -Not For Use With Hot Water. 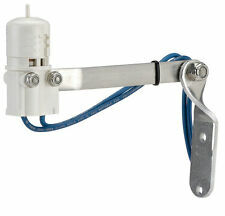 Hunter Mini Clik Rain Sensor - Weather Hardwired W/ Bracket detect 1/8-3/4"
This is a new Hunter Mini Clik Rain Sensor. The work with 1/8_3/4" levels. Item is in new/unused condition with open/torn box. The condition is always disclosed truthfully as New, New-Other or Used. I list the contents that are included in every sale. If an item is not listed such as a manual, original box or other small accessory, then I am not including that specific item in the sale. The Hunter Pump Start Relays have been created to provide that reliability - as well as a lockable NEMA rated enclosure at an economical price. Hunter Pump Start Relays are available in a choice of three models to accommodate a variety of power sources and landscape needs. Part Number: 466500. Have a plot plan?. I can design. Have a technical issue?. I can resolve it. Located outside the United States?. No problem! We are here to exceed your expectations! Use with X-Core®, Pro-C® and I-Core®, and ACC Clik sensor inputs. The probe is easy to install – simply bury it to the correct root depth for your plant material. Connect to Hunter sensor inputs, or use to interrupt common wires in virtually any 24 VAC irrigation system. Full waterproof function. (Outdoor Use). Suitable water temperature: 0-40 degrees Celsius. Suitable for 0-8 kg water pressure;. Suitable for 0℃-40℃ water temperature;. Australia,Canada,United Kingdom. WR2 Series. Rain Bird designed the new WR2 wireless sensor to exceed the standard. Have a plot plan?. I can design. Have a technical issue?. I can resolve it. Located outside the United States?. No problem! Dial Unresponsive. Blank or Dim Display. Unscheduled Running. Rain Bird XMTOOL Xeriman Tool. The Xeriman Tool (XMTool) is a tool for drip irrigation appilications. Provides fast, easy, one-step installation of Xeri-Bug™ emitters, PC Modules and ¼" barbed insert fittings directly into ½" or ¾" drip tubing such as Xeri-Tube™ (XT-700). That's it! Ideal for programming a watering schedule for your garden. If you want constant watering turn the dial anti clockwise. Can be stopped at any point just by turning off the tap. Push on your garden hose. These will work on all models: RC-4bi, RC-4c, RC-7bi, RC-7c, RC-1260bi and RC-1260c. Paint defect on back (Photo 4), Excellent condition. Tested and is fully functional. Create a watering schedule for your sprinkler system from anywhere by using a smartphone or tablet. Covers 7 zones. 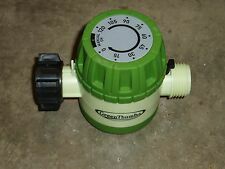 Gilmour Single Outlet Electronic Water Timer (9100NGF). Shipped with USPS Priority Mail. Can be set to shut system off from 1⁄8" to 1" of rainfall. HUNTER MINI-CLIK RAIN SENSOR. Perfect for international use! This is the BRACKET version of the mini-clik, "normally closed" sensor. BRACKET MOUNTED VERSION. Manufacturer: Orbit. Give us a shot and we will make sure that you will look to us again! You're already purchasing the item. • NO Power or batteries needed! My goal is that you find the exact product that you need. Need to know "how"?. I'm The Sprinkler NUT! @ SPRINKLERHUT! ASK THE SPRINKLER NUT. BTT is the perfect durable indoor and outdoor wireless solution for nurturing gardens, greenhouses, terraces, potted plants, flower beds, nurseries, and small lawn areas located in spaces without available in-ground irrigation. 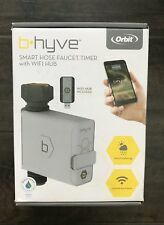 Orbit B-Hyve Bluetooth Smart Hose Faucet Timer w/Wi-Fi Hub #21004 BRAND NEW!. Condition is New. Shipped with USPS Priority Mail. Predictive watering adjustsschedules based on forecast temperature, rainfall probability, wind and humidity to provide maximum water savings while keeping your landscape healthy and beautiful. Two general purpose sensor ports can be used for many different functions. K-Rain RPS469 Model 3609 RPS Outdoor Irrigation Controller 9 Zones/Stations 220V. Condition is New. Shipped with USPS Parcel Select Ground.